Hey guys so I am not sure if this is a change in Android 4.3 but the little clock beside the battery meter is gone on the lock screen (see picture below). 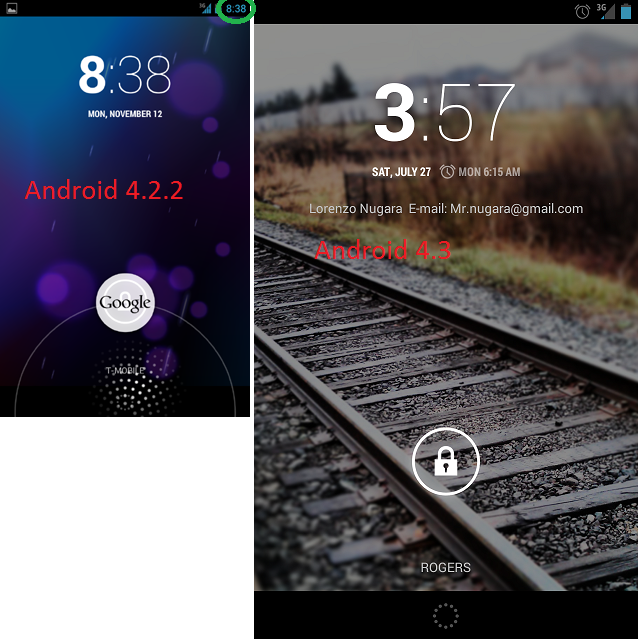 I checked my friends Nexus 4 that has 4.2.2 on it and it is there. I think its on a per widget basis. When there is a widget that doesn't include a clock (like the music player), the time comes back. Its a really nice addition. Nice find I just tested that out. That makes sense. If anyone else finds any other minor visual changes feel free to post them in here! - The camera now only rotates the icons rather than the WHOLE damn UI when you turn the phone, so that it doesn't disrupt the picture taking experience, like in 4.1 (4.2 broke this as well). - You can now take photos using volume keys in the Camera app. - The Nexus 4 touchscreen now responds to MUCH lighter touches. This means that typing (esp. gesture typing) is now much much nicer. - Animations are definitely smoother. While not at Windows Phone or iOS levels just yet, the whole OS is much snappier. - Many new Developer Options for optimising apps to 60FPS. - Hidden Notification history in the settings. - Possibly improved battery life: I noticed a 10% drain after 40 mins (screen on) of reddit/chrome/Google+ etc. That might have lasted 20-30mins before. I'll have to do some objective tests later. I have a feeling the animation when you bring up or hide the keyboard in apps is a new or changed animation?